Mineral and hydrocarbon extraction and infrastructure are increasingly significant drivers of forest loss, greenhouse gas emissions, and threats to the rights of forest communities in forested areas of Amazonia, Indonesia, and Mesoamerica. Projected investments in these sectors suggest that future threats to forests and rights are substantial, particularly because resource extraction and infrastructure reinforce each other and enable population movements and agricultural expansion further into the forest. In each region, governments have made framework policy commitments to national and cross-border infrastructure integration, increased energy production, and growth strategies based on further exploitation of natural resources. This reflects political settlements among national elites that endorse resource extraction as a pathway toward development. Regulations that protect forests, indigenous and rural peoples’ lands, and conservation areas are being rolled back or are under threat. Small-scale gold mining has intensified in specific locations and also has become a driver of deforestation and degradation. Forest dwellers’ perceptions of insecurity have increased, as have documented homicides of environmental activists. To explain the relationships among extraction, infrastructure, and forests, this paper combines a geospatial analysis of forest loss overlapped with areas of potential resource extraction, interviews with key informants, and feedback from stakeholder workshops. 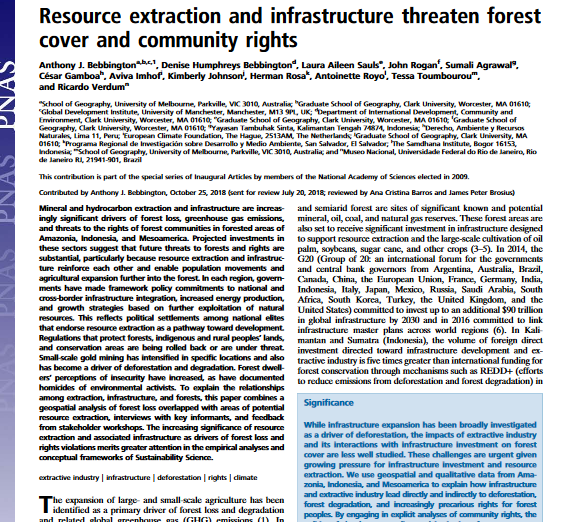 The increasing significance of resource extraction and associated infrastructure as drivers of forest loss and rights violations merits greater attention in the empirical analyses and conceptual frameworks of Sustainability Science.